Futuroscope Theme Park will travel with Ride the Flavour! On Friday, June 28th, the sun was entirely hidden by a thick coat of grey clouds. The Futuroscope Theme Park was nevertheless radiant. It was the theater of a beautiful gathering organized by Philippe Jonvel, in charge of external relations for the Futuroscope. Noël Gutrin and Frédéric Monzo, head chefs in Futuroscope restaurants, were the on-the-spot first ones. Then came the Futuroscope women’s professional cycling team. Finally, several agents of the park joined us, riding skillfully their Veloscoot electric bike. Why had all these people arranged to meet ? We all were here to celebrate our partnership, the partnership between Ride the Flavour and the Futuroscope theme park! What is this partnership about? The details are following… Just “read more”! Established in 1987, the Futuroscope became the first French theme park. Since then, it has welcomed more than 40 million visitors. The words best representing the Futuroscope are high-technology, new visual experiences (4D movies, shows combining audio, water and light effects, shows, etc.) and learning while having fun. These are the keys of its success. The first axis of the partnership the Flavour-Futuroscope is of course the travel. Throughout our world tour, we will be the ambassadors of the Futuroscope. 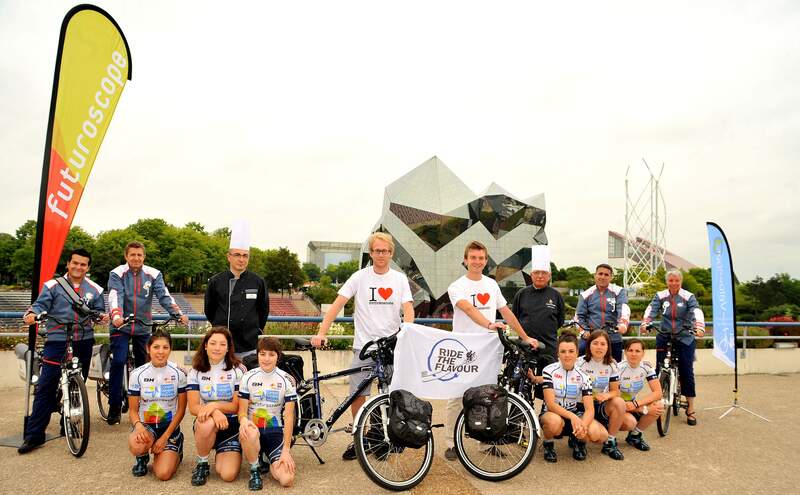 Wearing our ” I love Futuroscope ” T-shirts, we will make the spirit of the Futuroscope travel around the world! We also found a second common ground, and not the least : gastronomy. Within Futurscope, the Kadéliscope restaurant will synchronize on our route to serve dishes seasoned with the traditional spices of the countries where we will be. The menus of the Kadéliscope will have from now on a history to tell. Together, we will follow the spice route! Our partnership is clear… it is now time to hit the road ! Welcome to Futuroscope Theme Park and thanks for following us!